Basically Shri Mehandipur Balaji Temple is Lord Hanuman Ji's Temple Long ago the image of Lord Balaji and that of Pret Raja (the King of spirits) appeared from the Arawali hills. 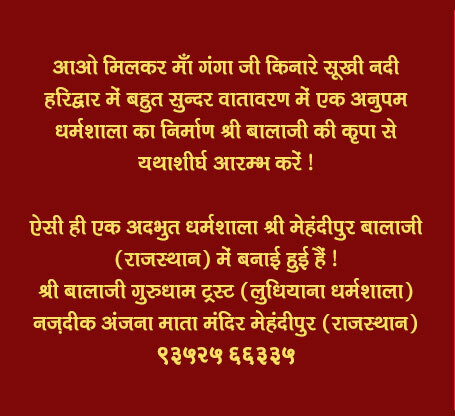 Now people suffering from malignant spirits and black magic or spell get their relief when they make an appeal for relief to Shri Bheruji Pret Raj Sankar who holds his court and awards punishment to the malignant spirits, ghosts, goblins, ghouls, evil eyed witches etc. Shrine of Balaji, Court of Pret Raja, Pooja griha, Bheruji temple are sum of the spots worth seeing here. Religious ritualistic performances, charity, feeding the poor, homeless and incapacitated people, water supply for all and fodder for cows and stray animals are the activities of this temple. 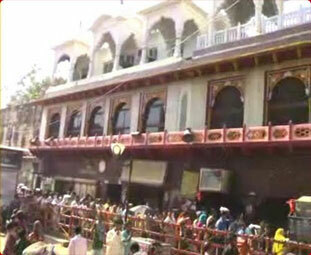 Balaji temple at Mehandipur in Rajasthan is one such place. 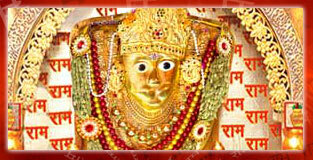 It is believed that the deity in this temple has divine power to cure a person possessed with evil spirit. Hundreds of 'Sankatwalas', as the possessed people are refereed to in local lingo, throng to the temple everyday to offer prayers and have 'darshan'. The temple has also become a home and the last respite for the victims. The 'Mahant' of the temple, Shri Kishor Puri Ji, prescribes the treatment. It can include reading holy texts, following a strict vegetarian and simple diet, and even afflicts physical pain to one's body. One can witness people going through various physical therapies like keeping heavy stones on their body – on arms, legs and chest – to ease their pain. There are others who inhale the smoke that fumes out of the sweet Patasa’s kept on smoldering cowpats. The ones with serious case of spirit possession, who tends to get violent, are even shackled in chains within the temple premises. This may appear a bit anachronistic at the first glance, but thousands of people are believed to have been cured in this way. Festival time (Holi, Hanuman Jayanti and Dusshera etc) are regarded as the most auspicious time to emancipate from the evil spirit Medical science may discard such approach to the ailment as ‘self-deceptions based on blind faith’, but for the believers, the power of Balaji is something supernatural, something beyond metaphysics.